We all love our pets and, were we to lose one, would miss it greatly. Therefore, if you have any information on any of the animals on this page, won't you please do whatever you can to help reunite it with it's owners. Thank you! Page updated February 19, 2019 6:04 a.m. MISSING DOG ALERT! 10.19.16 7:49 A.M. MISSING DOG ALERT! 08.31.16 6:45 a.m.
Update: Buddy is still missing as of 09.08.16. 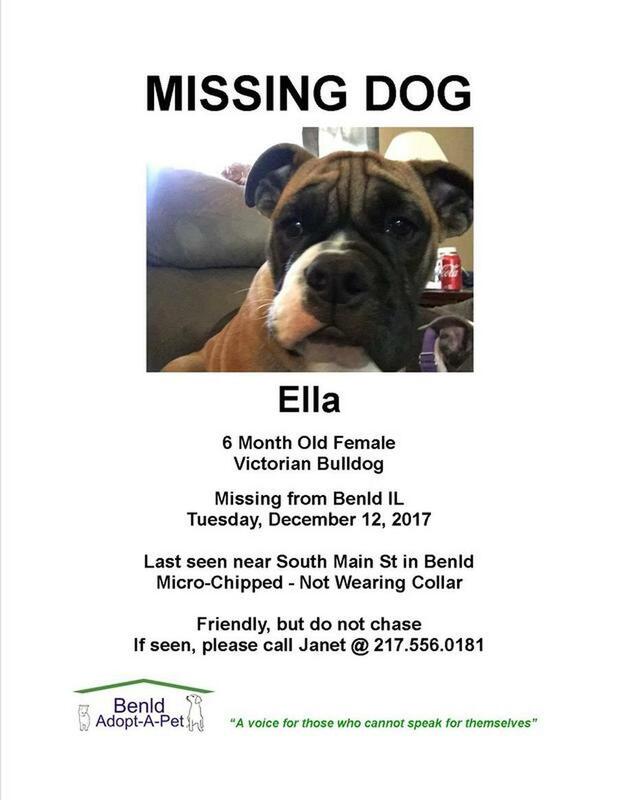 MISSING DOG ALERT! 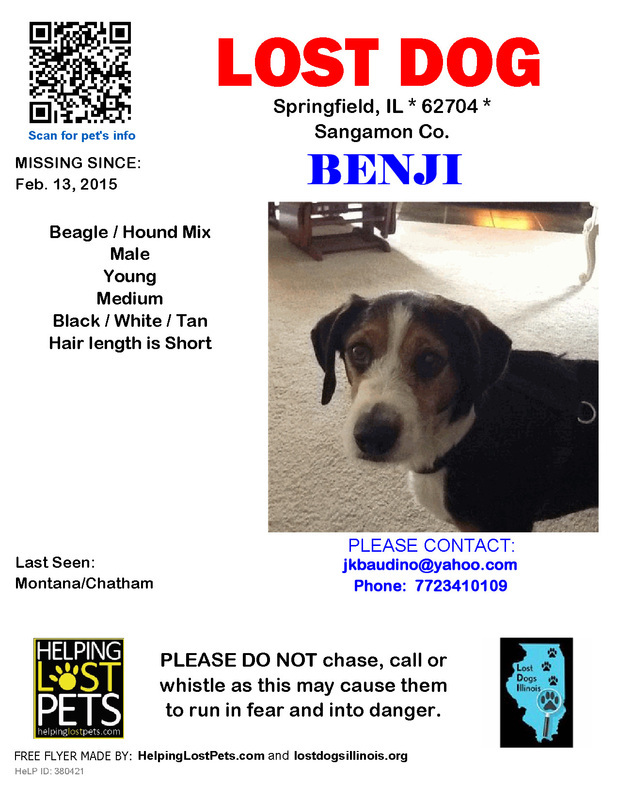 08.18.16 1:30 p.m.
Shellington is missing in the Riverton-Spaulding area. 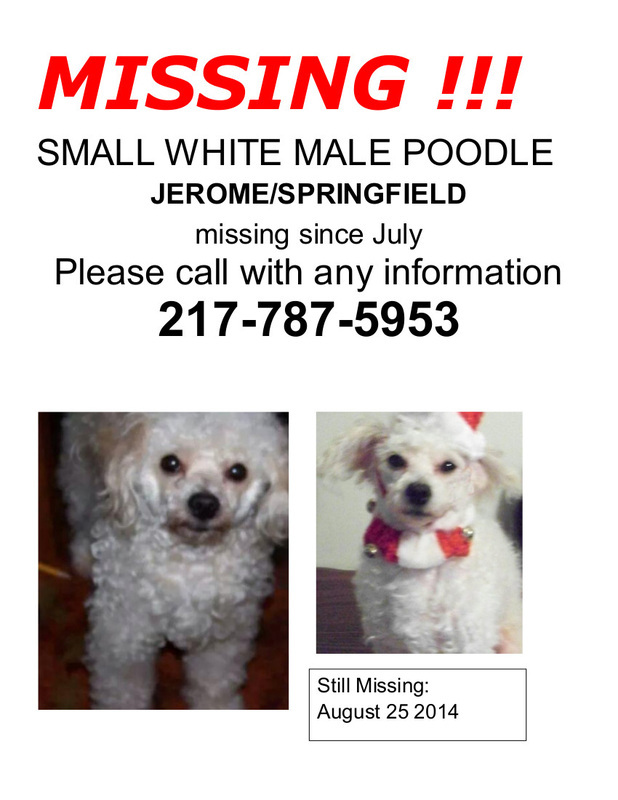 Missing: 1-2 miles south of Virden Ave, Virden IL 12.24.14. 10 year old male, white with brown spots Bird Dog / Lab mix. Wearing olive green cloth collar when last seen. Friendly but may be shy and run off if approached. If you see Gizzie, please call Dennis Keher at 217.899.8823. Thank you! 07.21.14 White City IL: 3-4 year old un-neutered male Black Lab. Has black spots on tongue and a grey goatee. Was wearing black collar at time he disappeared. Very friendly. Missing since 07.05.14 from White City IL. If you have any information about this dog, please call Lorie Bogard at 217.371.6627. Thank you! 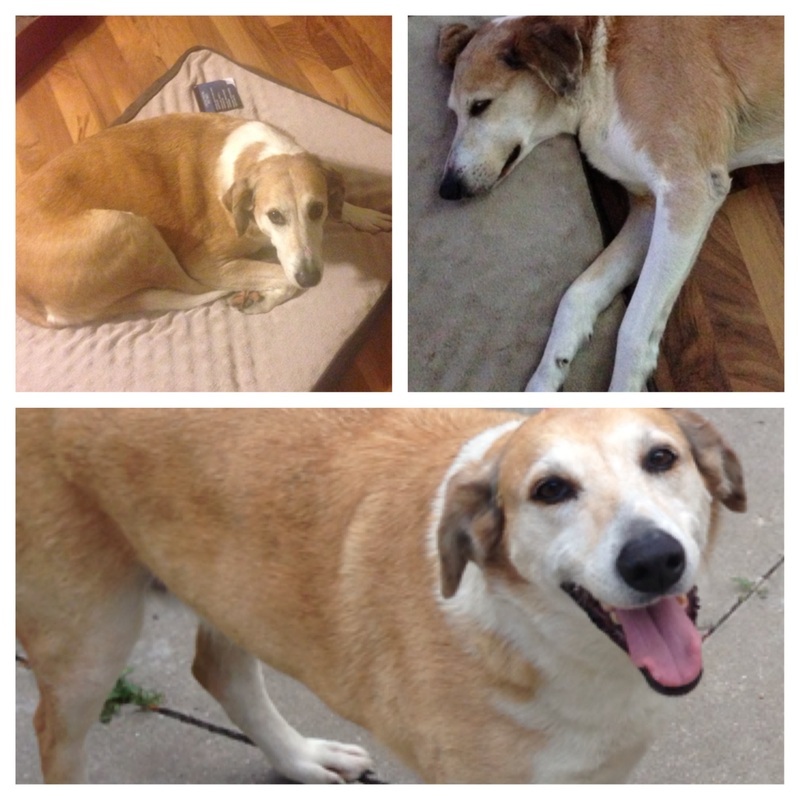 06.02.14 Thayer IL: Name: Goldie, light tan, spayed female, 3 year old Beagle mix (has pointy nose), was wearing collar when last seen at north end of Thayer IL. She is very friendly and is dearly missed by her family. If located, please call 217.965.4468. My name is Flossy. 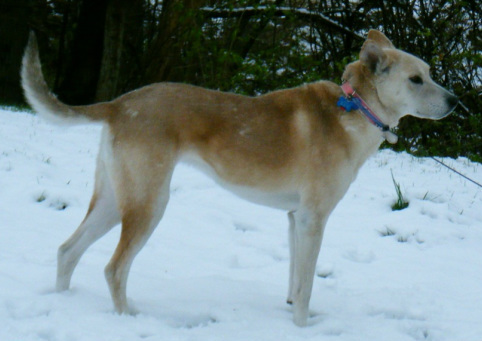 I am a Saluki mix, about 8 years old. I am a very good girl, thought I am shy around strangers, especially men. I am brown with white patches, and I weigh about 52 pounds. I disappeared from my home on Charity Church Rd in Carlinville IL on May 6, 2014. Please call 217.836.4972 if you see me, because I really want to go home to my family, and I know that they really want me back! 04.11.14 White City IL: 2 Pit Bulls. Adult; Brindle & White, Female, Pit, approximately 3-1/2 years old, missing since 04.07.14. Puppy; Brindle, Male, Pit mix, approximately 6 months old, missing since 04.10.14. If you have seen either of these dogs, please call Brittany Kirkwood at 217.883.1278. Thank you! 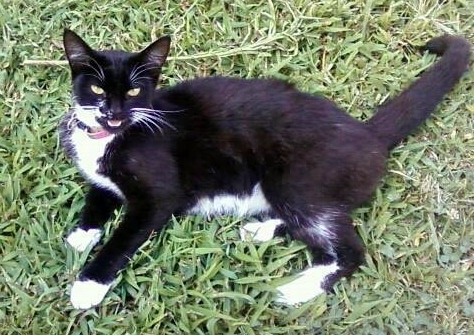 04.02.14 Harvel IL: Black & White, Female, Domestic Short Hair, approximately one year old. Missing from Harvel area since December 2013. Was wearing a green & white striped flea collar when lost. If you know where she is, please call Justice Kyrie at 217.720.5875, or e-mail: trackgrill13@gmail.com. 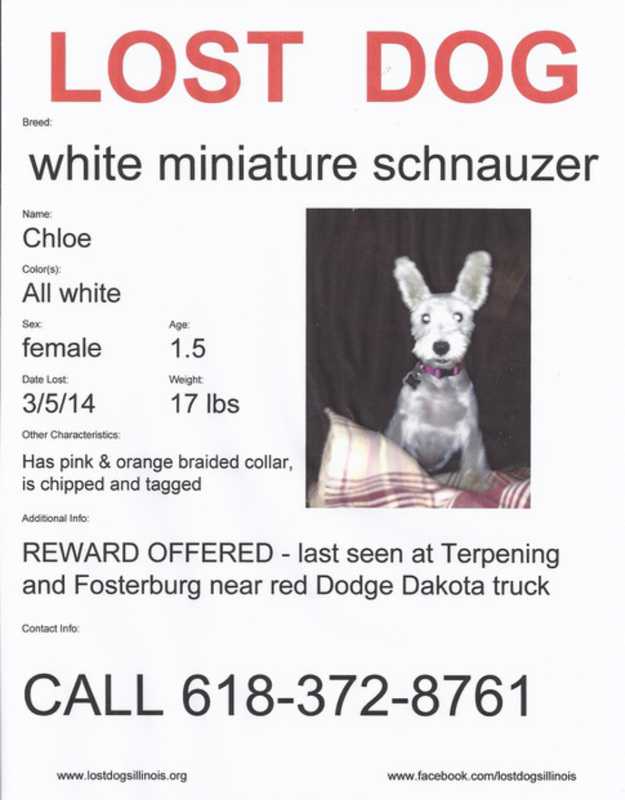 07.21.14: Chloe is still missing as of this date. 01.23.14 Rural Staunton/New Douglas (Double Arch Road) area IL: Brown Boxer with white stomach & marking on his back hip from stitches last October. Was wearing a Royal Blue collar at time he went missing. If found, please call Amanda at 309.242.8866. Please help us get him back! 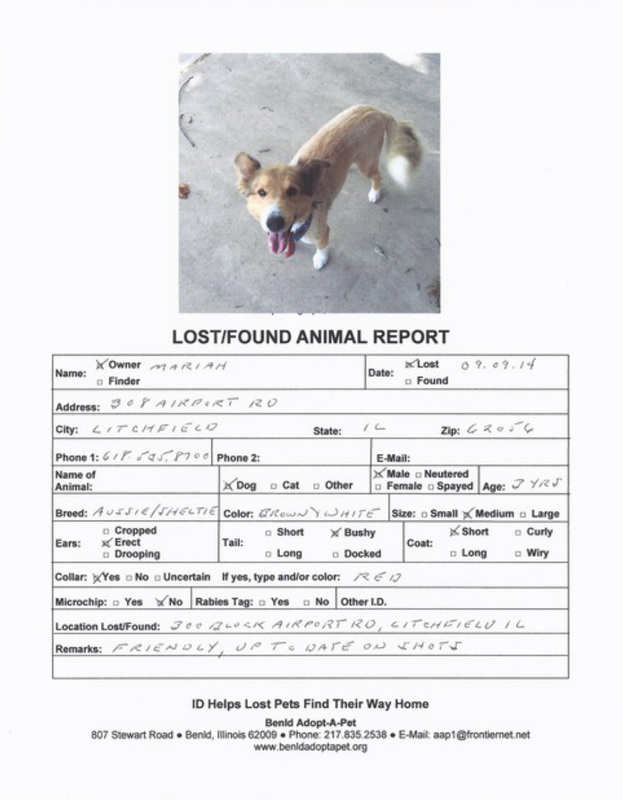 01.21.14 Gillespie Lake Area IL: Eleven year old neutered male miniature brown & white Chihuahua, missing most of his teeth, not wearing collar at time he went missing. Should come if called by name, and may also respond to word "chicken". Family wants him back badly. Please call 217.313.6394 or 217.835.2538 if found. 10.16.13 Maryville IL: 13 year old female spayed white & tan Husky mix. She is wearing a US Navy collar with tags and is microchipped. Faith is extremely timid but not aggressive. 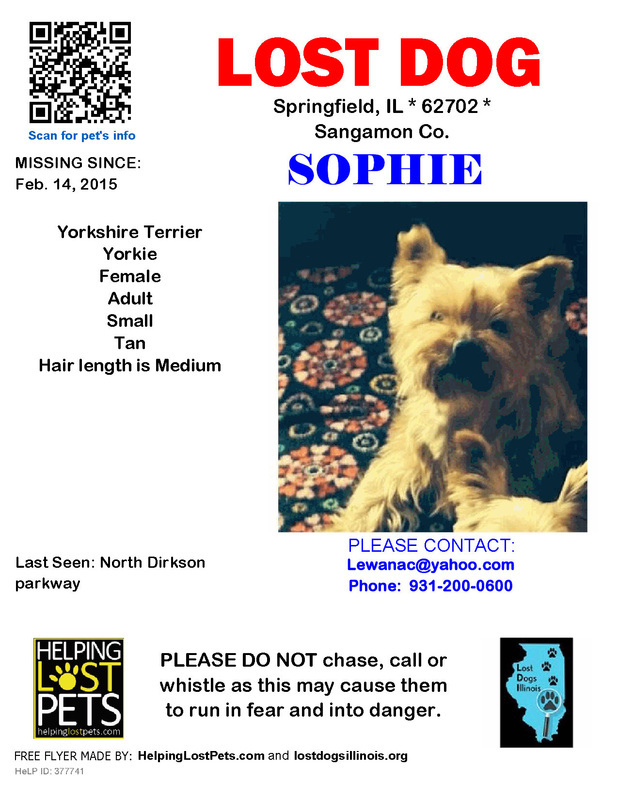 She was last seen near Keebler Oaks in Maryville IL. Please help us get Faith back. If you see her please call/text 618.407.7103. Note: If you see her, please do not chase after her, but just call the above number as soon as possible. 10.24.13 Thayer IL: Female orange tiger cat. Has small white spot on cheek. Please help get her back home. If found, please call 217.965.2167. 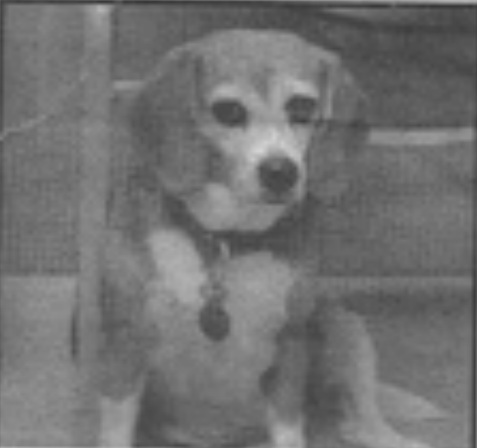 08.26.13: Virden IL: Mini-Beagle, small spayed female with brown, black & white markings, approximately 9 years old, not wearing collar. 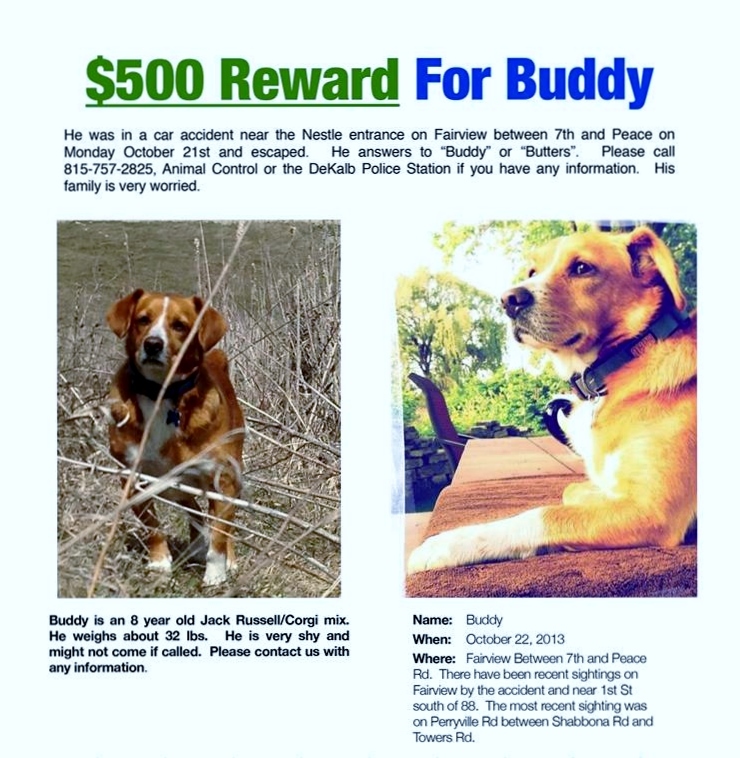 Last seen in vicinity of East Park in Virden. If you have seen this dog, please call 217.971.7347 or 217.851.2097. 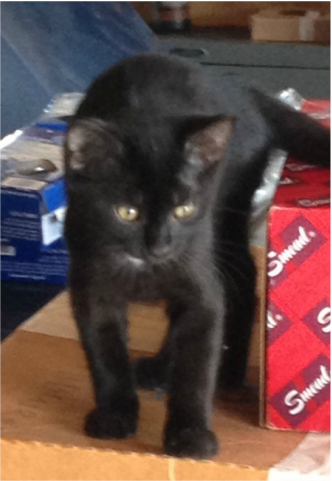 07.31.13: Bunker Hill IL: Domestic Short Haired cat, 4-5 months old, small, black, male. Missing between Staunton and Bunker Hill. If found, please call Leslie at 217.556.2096 or 618.585.3494. 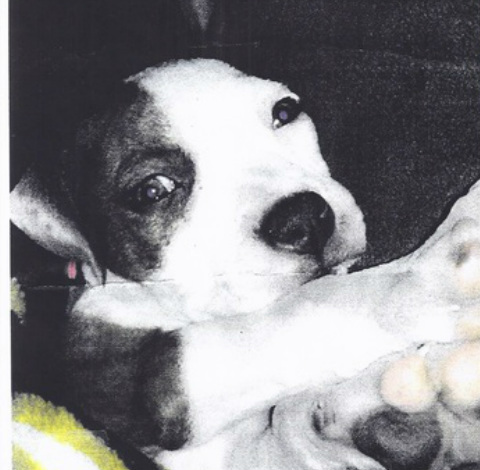 06.01.13: Staunton IL: American Bulldog, Black & White, approximately 8 month old male, last seen in vicinity of Reservoir Road. If you have seen, or know anything about his whereabouts, please call Glenn at 618.635.5523 or 217.710.4838. 07.07.13: Springfield IL: Bella, a Female Chocolate Lab weighing approximately 100 pounds was last seen on the west side of Springfield on July 4th, and was wearing a red collar. Please help bring Bella home; she has 3 little boys that really miss her! If you have any information as to her whereabouts please call 217.306.6710 or 217.494.1468. 07.12.13: Virden IL: Coco, eight month old male Apricot Poodle, from east side of town by baseball field. Two little girls very upset and miss him. If you can help him get back home, please call 217.931.2242 or 217.415.7964. 06.07.13: Virden IL: Lola, a 3 year old spayed Weimaraner with a small scar on her nose, and who is very scared of storms, escaped the invisible fence on May 20th. She was wearing a collar when last seen. If you see her Please call 217.439.7347 or 217.415.2599. Still missing as of June 30, 2013. 05.30.2013: Scottville/Modesto IL: Duddley, a 4 year old male blonde Pomeranian with thick bushy hair, was lost in the vicinity of the Scottville/Modesto/Nortonville gravel roads. Duddley has a very friendly personality and was wearing a collar with tags bearing his name and a now invalid phone number. If you have seen him, or know his whereabouts, please call 217.439.7220 or 217.370.1229. 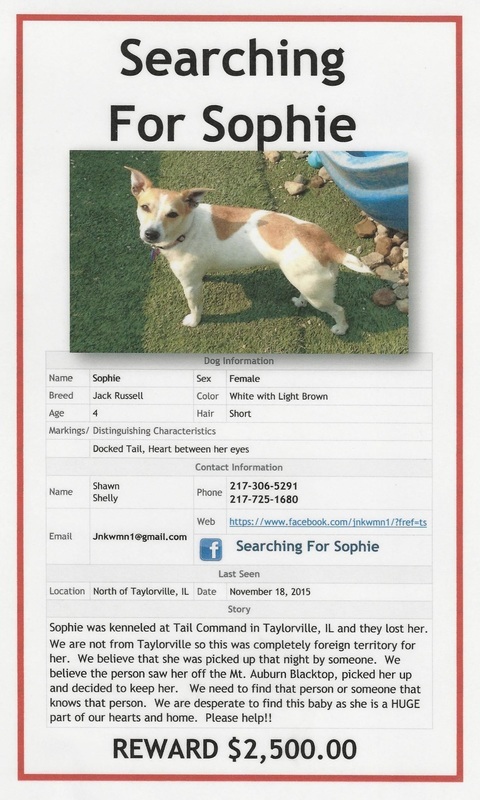 06.04.2013: Bethany MO: Penny, our Jack Russell Terrier came up missing while being boarded at Trailway Veterinary Service in Bethany MO. The Vet took her out for a walk and let go of her leash. We are located just south of the Iowa/MO border off of I-35. She has been missing since December 12, 2012, and we have searched everywhere for her... no one has ever seen her. She could be ANYWHERE and we have reason to believe she was "taken". Please see attached flyer with her photo/information and be on the lookout for her. We love and miss her dearly and will not stop searching for her!! 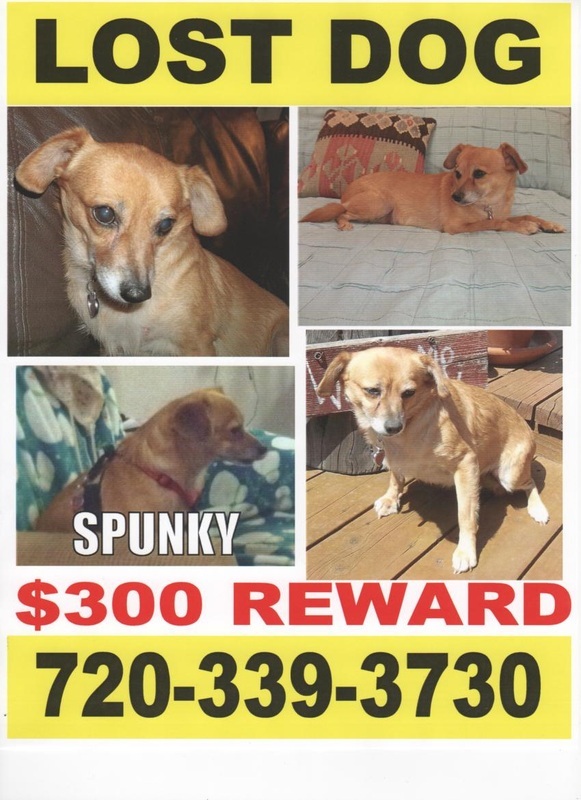 05.31.2013: Troy IL: Spunky, a Chi/Doxie mix, has been missing for two weeks now. She is from Colorado, and was visiting in Troy IL with family, when she got out of a fenced yard. There have been reports that she has been seen going North. 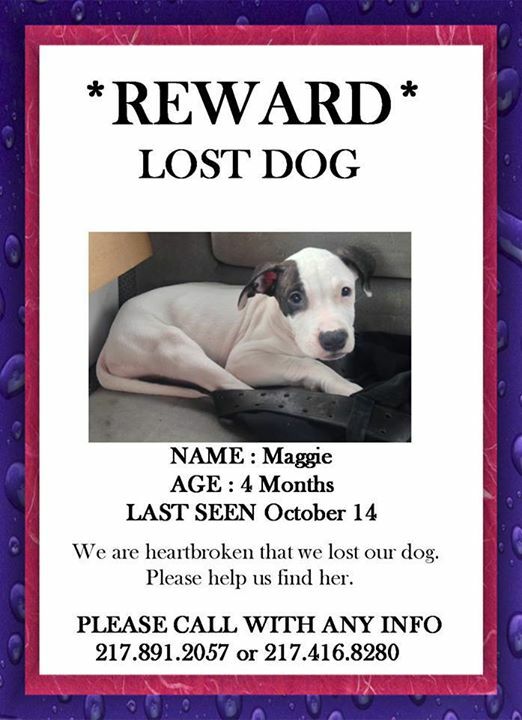 Her family has notified all the shelters and Animal Control Facilities in our area and put up flyers. The contact number is on the flyer, but you may also contact Jeff Pirtle in Troy IL at 618.667.3065. 05.10.2013: Gillespie IL: Chihuahua, white & tan, young, adult, female. She has been spayed, micro-chipped, and is up to date on her shots. Friendly, but is likely scared. 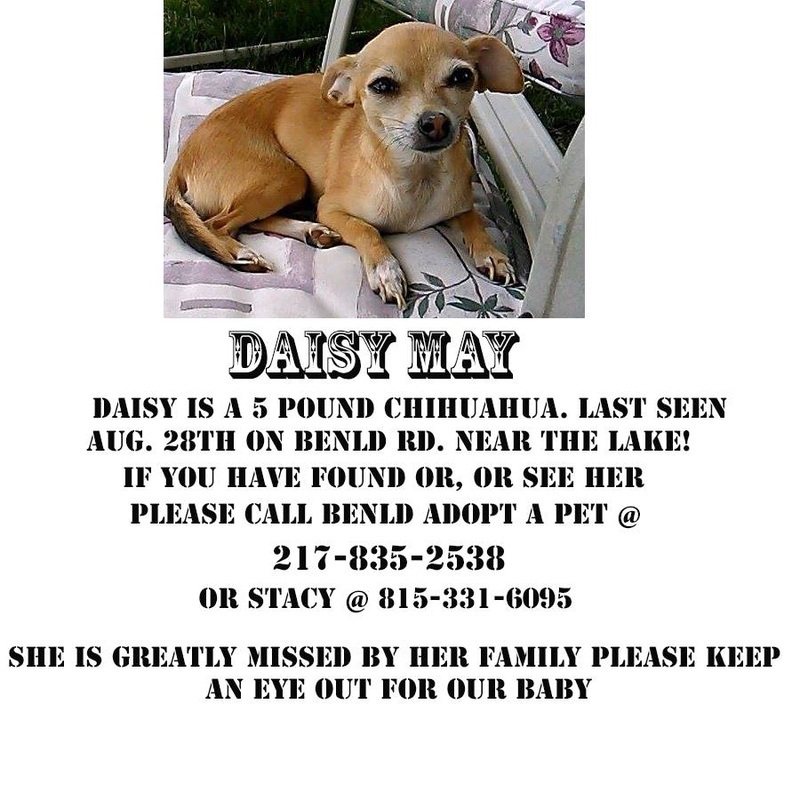 Owner misses her very much and requests assistance in getting her little girl back. If found, please call Benld Adopt-A-Pet at 217.835.2538. 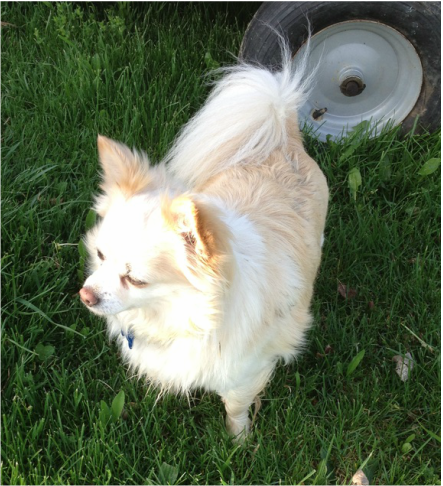 05.15.2012: (approximate): Carlinville IL: Pomeranian, short (when last seen) sandy hair, 2 year old, male. Weight approximately 3 pounds. Small black crusty area on left cheek. Needs medication. 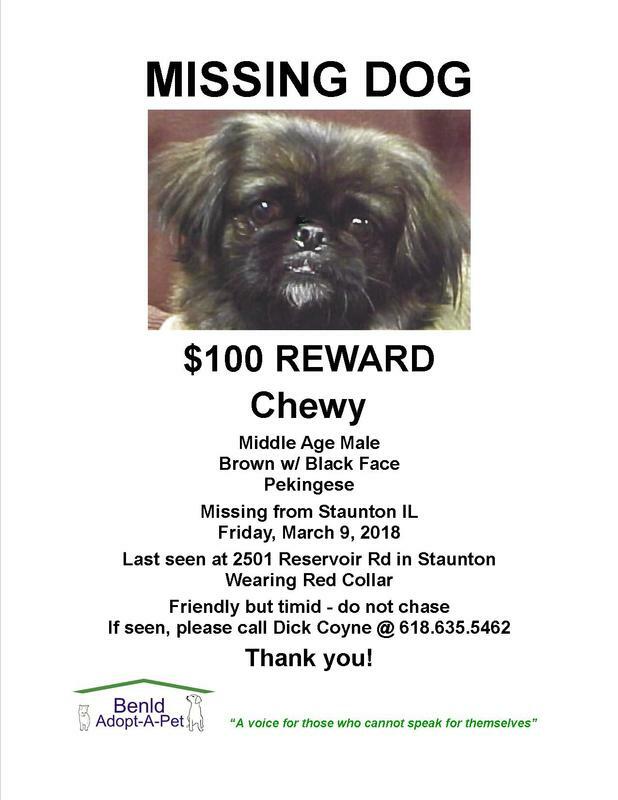 Last seen in Sears Homes area of Carlinville. If found, please call owner at 217.854.3221 or Benld Adopt-A-Pet at 217.835.2538. 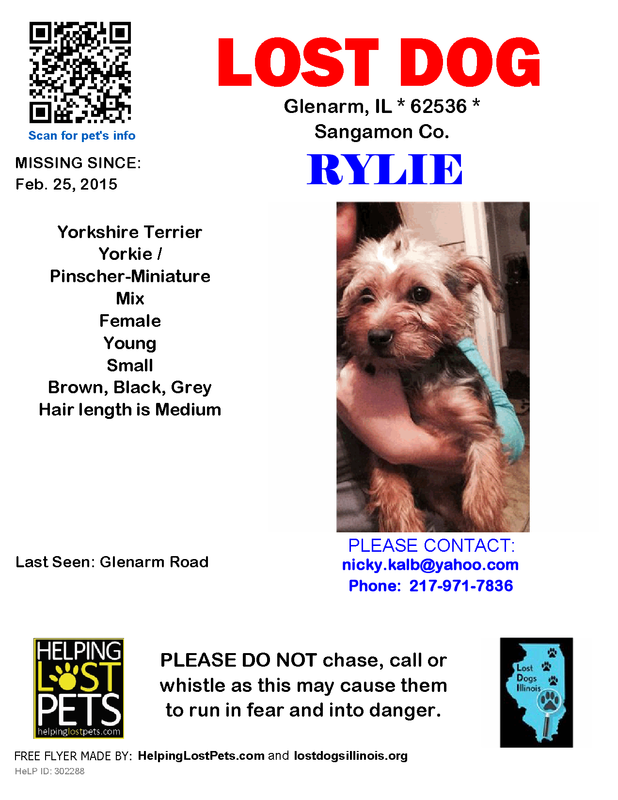 04.03:2013: Gillespie IL: Yorkie, gold & silver, 7 year old spayed female. Weight approximately 8 pounds. Lost 4 miles west of Gillespie on Route 16 vicinity of Walker Road. If found, please call owner at 618.362.6358 or 217.556.2386, or Benld Adopt-A-Pet at 217.835.2538. 03.05.2013: Mount Auburn IL: Siberian Husky, 3 year old therapy dog, gray & white w/solid white face. Has very friendly disposition. 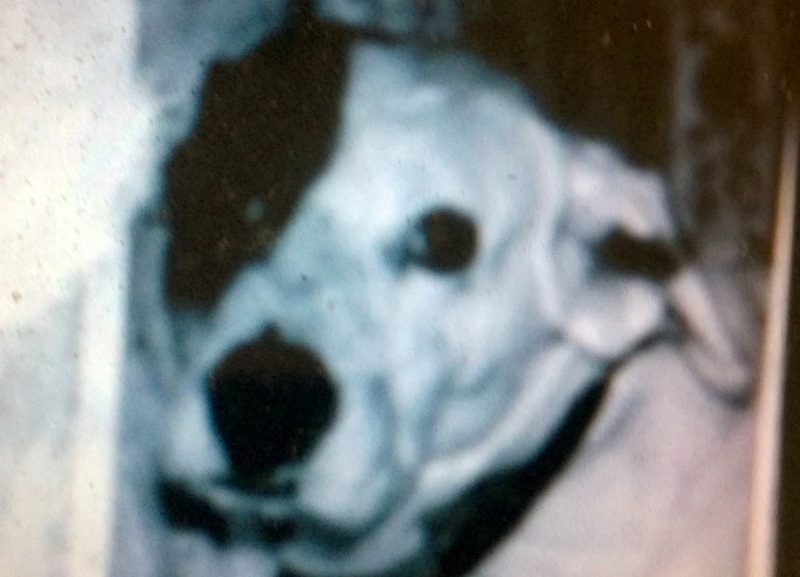 Last seen March 5, 2013, before digging under fence and tearing off collar in process. Family is devastated by loss of their boy and desperately want him back. If you have any information as to his whereabouts, please call 217.761.7608. 1. Search the Animal Shelters in your area, either online, by phone or in person. 2. Register your lost pet with as many online services as possible. 3. Visit local shelters and check websites every three (3) days to see if your pet has arrived. 4. 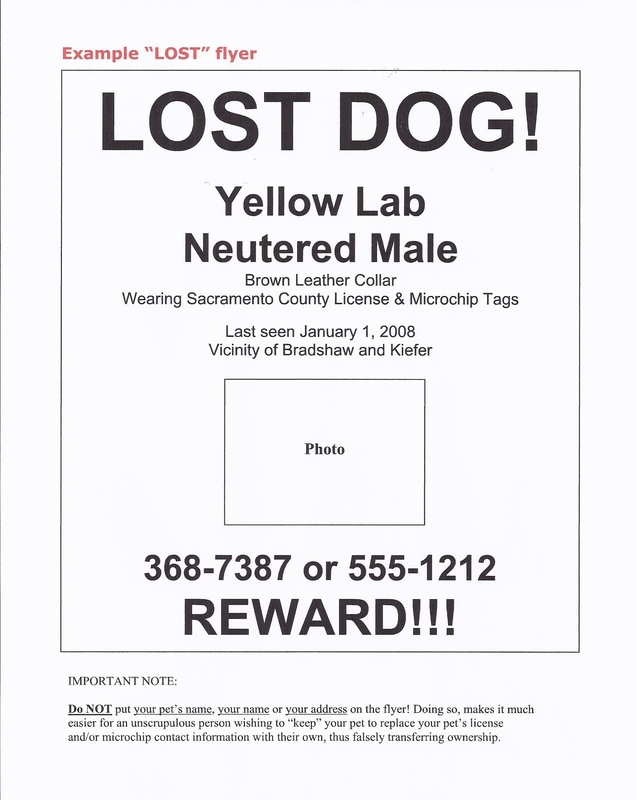 Post flyers within a mile or more radius of where your pet was lost at vets, stores, schools and churches. Include date and place where lost, type/breed and your phone number. Do NOT list name on flyer! 5. Place a yard sign in front of your house, with a photo of your missing pet and your phone number. People who find a lost pet often will walk or drive around the area, trying to find the pet's owner. 6. Place an ad in the lost and found sections of papers and online bulletin boards. 1. First, look up the pet's Animal Shelter Number. 2. Provide rabies vaccination history from your vet; your pet cannot be released until history is verified. 3. Provide license status. Pets cannot be released unless the licensing information is up-to-date.